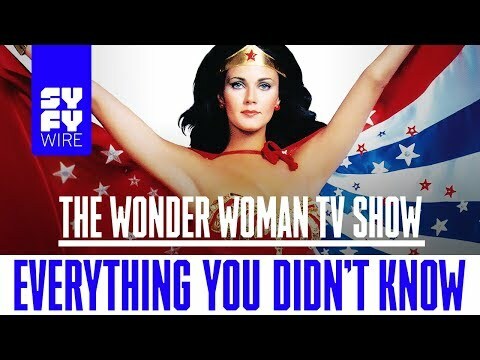 This 12-minute video of Lynda Carter's better moments should appeal to anyone with nostalgic memories of the popular series, and perhaps it will encourage some discussion of the show. There's certainly never been a more attractive superhero, although I think Miss Adrianne Palicki's brief outing as the Amazon princess is at least a close second. In my entire life, I have had only one freakish obsession with a celebrity...Lynda Carter. It's hard to remember the days before streaming and home video. When WONDER WOMAN aired on Friday night, I moved my chair in front of TV and people quickly learned that there would be Hell to pay if my viewing was interrupted. And she's a star who never let her fans down. She's aged more than gracefully and treats WONDER WOMAN with respect. Brent, I think she would be a perfect Queen Hippolyta! Queen Hippolyta, indeed! It certainly runs in the family. That IS quite a lot a hip. 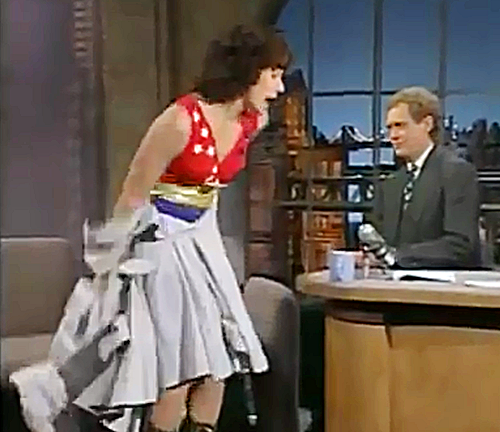 Wow, what a wonderful clip of Debra Winger with David Letterman, knocking his socks off by suddenly shucking out of her dress to reveal her Wonder Girl costume underneath, after David pretended to surprise her with a clip of her first superhero transformation in an episode of Wonder Woman. This is from the clip. And these are from the Letterman excerpt. She dashed off the stage, sprinted right up the isle, and ran out the back door of the studio! Lynda Carter was the Wonder Woman, for sure. I do think the first season, set during World War II, was the best. Well, it actually looks more like she's pulling on the walls to developing her pectorals. "We must . . . we must . . . must increase our bust! The bigger the better, the tighter the sweat, the men are depending on us!" By God, I think it's working, too! Fans of Linda Carter (which means "everybody") will enjoy this well-made photo essay that shows the popular actress from ages 1 to 67. By Jiminy, it's time for a new video about Wonder Woman.